[Gary Petty] You and I were born to receive incredible spiritual power from God that is described in the Bible as “love, power and a sound mind.” That’s what God wants to give you. Why were you born? We asked that question to a number of people and we got some interesting answers. > That was a heck of a question. » Cause my mom and dad decided it was time to have a baby. >I’d say giving back and helping others. [Interviewer] Why were you born? » Because my parents planned me. I think. [Gary Petty] What is your purpose in life? There isn’t a more important question that we can ask. Now you to want to take a moment and I want you to think about in your life a time when something happened. Maybe a tragedy. Something wonderful like a wedding or the birth of a baby. But it changed the way you see life. Think about that. We’ve all had moments like that. When that moment happened, when that event happened, it changed the way you see life. I want to share with you an experience I had a number of years ago that changed my life. I was living in San Antonio, TX and the congregation where I pastored we helped set up a shelter for victims of Hurricane Katrina. It was interesting I mean we went in we helped set this thing up. It was in an empty shopping mall. And in that empty shopping mall we went in there was a huge department store and we went into this department store and we set up just like in this picture here all kinds of cots and some blankets and we got some used clothing as people started to contribute and trucks started to show up and we started to take those things and try to organize it. But we weren’t prepared for when the first bus loads came. These people came in they didn’t even know where they were. They had been plucked off of the tops the roofs of their houses and then they had been brought in, flown into San Antonio, and put on buses and the first thing they asked is, uh where are we? It was pretty embarrassing for them because the first thing we had to do was they had to come out in the parking lot where there was a makeshift curtains up and there they were given a shower and given some used clothing because their clothing had all been contaminated. We had to throw all their clothing away. And then they were brought inside and we gave them a piece of pizza and a bottle of water and then said find a cot. You can imagine there’s families. Find a cot and a blanket and we will help you with more as it comes in. And they would wander around, they were always thanking us, as they wandered around and got cots. And okay, this is what their life had come down to. Most of them had lost everything. But there was one woman that caught my attention. She was a young woman and she was sitting on the edge of her cot just looking down. She never looked up, she never talked to anybody. And I’m busy and I walk by that woman numerous times and then one time I stopped and I reached down and I said can I help you. And she looked at me with the greatest look of despair I’ve ever seen in a human being and she said where is my baby. It’s in these moments when tragedy is overwhelming, when there seems to be no hope that we are faced with why am I even here? You know, why is there even a meaning to this life? And if there is a purpose for human life why would a loving God allow this woman to lose her baby? Where do we even find an answer? Where would you go to find an answer to the question why was I born? You know the reason we ask this question is because in every one of us there is a hole in our psyche. A huge, hungry emptiness. To connect to something or someone bigger than ourselves. Now we try to fill that hole with all kinds of things. Booze, fun, all kinds of relationships that we end up just throwing away, and it never gets filled. So we search among the clutter of our conflicting ideas from religious people, from educators, from politicians and we try to find sense of this. But you know what, at that moment the pat answers for the purpose of life can seem rather pointless when you are talking to people whose entire lives have been brought down to a cot, a blanket, a bottle of water and a piece of pizza. That’s it. That’s all they have and they don’t even know where they are. Why am I here? Now unfortunately most of us don’t ask the question about why was I born until we’re in difficult times or we’re in some kind of difficult situation. Now let me ask you something. Do you think that the question “why was I born?” might actually be a conversation starter? With who? With a Being whom you cannot see. A Being who is all-powerful. A Creator who just might have an extraordinary purpose for you. Now I can tell you where I found the answer. You know we are all searching for the same question. I can tell you where I found the answer. I found it in the Bible. I believe, and I tell people I believe it because I want people to understand where I am coming from. I believe this book is the Word of God. And I believe in this book we can discover, you can discover, what the Creator says about why He created us. What’s the purpose in all of this? And you know, according to this book you have a higher purpose. According to this book you have something to look forward to even in the daily grind. Even in the tragedy and it’s a purpose that almost no one has understood throughout human history. And you know where we begin? We begin at the very beginning of the book. Let me read here something that God says that is very important for us if we are going to understand why we’re here. If we’re going to try to make sense of what the world is and we’re going to try to make sense of hurricanes and what it does to people. How do I make sense of it? Listen to this. “Then God said, “Let Us make man in Our image, according to Our likeness; let them have dominion over the fish of the sea, over the birds of the air, and over the cattle, over all the earth and over every creeping thing that creeps on the earth. So God created man in His own image…male and female He created them.” (Genesis 1:26-27) God created human beings in His own image. Now okay there’s something at this point that we sort of become immediately aware of. I’m made in the image of God? I’m so finite. I’m so weak. I’m not omnipresent. I’m not all powerful. I’m a flawed temporary person. I’m a flawed temporary person. Well it didn’t say you were God. That’s sort of a Hindu idea that we are all god. No it didn’t say that you and I are god. It says we were made in the image of God. Okay. How are you made in the image of God? How are you like God? I, I don’t know how am I like God. I’m not like God. Let’s look at a few ways that you and I are like God. The first one is that we have free will. God makes decisions. God consciously makes decisions. You and I have something that you know your cat really doesn’t have. We make conscious free will decisions. God has reason. He is pure self-conscious intellect. You and I are self-conscious and we have the ability to think. Emotions. You and I have the ability to experience love, joy, empathy, grief, sorrow. What’s interesting is when you look through the Bible God experiences all these things. We have imagination and creativity. The ability to think in abstract thought. The ability to create things. I mean architecture, music, literature. I have a daughter who is an architect and she does something amazing. On her computer screen are words and numbers and lines and things that make no sense to me. It’s all abstract. It’s on the computer screen. It’s not real. And she can take that and give that to a builder and he or she can build a building. That is an ability that’s like God. I mean in a very limited sense obviously, but it’s like God. And then relationships. You were created to have relationships with other people and you and I were created to have a relationship with God. And this is a life changing truth. Because now you can begin to understand why you’re here and if you know the purpose of life you can have encouragement and hope even in the most difficult times. And, hope in the future. Now we do have a study guide all of you received the study guide. Because we can only cover a small amount of this information in this program. We want to give this to you so you can take it home and read it. And for those of you who are watching you can get your free study guide just like everybody here has. All you have to do is call the number on your screen or go to beyondtoday.tv and you can download it, you can order it, you can read it right online. But it’s available for you free because we want you to have a copy. So let’s recap a little bit of what we’ve covered here. Human beings were made in the image of God. But what happened to us? If you and I were made in the image of God why are we so flawed? Why is life so difficult? Why is it so unfair? Why is there crime and poverty and hatred, why do we die? If we’re made in the image of God explain this why. What went wrong? I mean if we’re made in the image of God and we live in this mess, what went wrong? At the core of our human problems, now when I say human problems I mean your marriage problems, your addictions, your violent anger, but I don’t just mean each of us individually. You know why can’t our government solve the simplest social problems, you ever – why? These are smart people and they can’t ever solve anything. Or the teenager that just robs a liquor store. Or the person who commits suicide. How does this happen? You see there’s a problem. You and I were made in the image of God and we’ve all become corrupted images of God. Something happened to us. I mean let’s just think of the five ways we talked about we were made in the image of God. Let’s go back to it. Free will. The ability to make decisions. You know what the problem with free will is? The ability to make decisions. Cause we make lots of bad calls, right? Lots of bad calls. You know what human history is? Human history is a story of human beings all making bad decisions who are then living with their bad decisions and we’re living with everybody else’s bad decisions. We just live in a world of bad decisions. Now I have to say here you and I can’t really understand why we have corrupted human nature until we understand that Satan is real. Yes he is a real being. And that the Bible reveals, and this is a shock to a lot of people, it says he is the god of this world. He influences all humanity and we’ll never fully understand that until we understand who he is and we will do a program in the future on Satan here on Beyond Today . Reason. Let’s go back to reason here. God is pure intellect. We are amazing in this ability to think. Then why can’t we solve the simplest problems? I mean we get the smartest people in a room and you know what they do? Well they’re all absolutely sure that their opinions are the best. And they all believe they’re absolutely right. So they argue and they fight and nobody ever solves anything. It seems like every answer we have to a problem it’s just short term. It never really solves anything. Emotions. Now this is where we can really agree on here. You know when we stop and think about this and we have any intellectual honesty, we look at this one – emotions — and we say I am messed up. Emotionally we’re a mess. We have uncontrolled anger, we have envy, we have hatred, we have selfishness, we have greed. You know what’s amazing? We talked about how God has emotions. Joy, love, peace, yeah anger – but it’s never uncontrolled. Our emotions aren’t God’s emotions. You and I are corrupted. We’re not the image of God. It’s like you took this nice statue made out of clay and took a hammer and just beat that thing so you couldn’t even recognize what it was. That’s what we are. The image of God has just got beat up so bad that you can’t even tell what we are. Imagination and Creativity. We take these incredible abilities that God gives us and what we do is we use these to hurt each other. We use these abilities to make war. We use these abilities to cheat and steal and lie and commit violence and end relationships. Can you wrap your mind around that? Can you really grasp what we just read? We were created in the image of God because God wanted children and He created children and He says you’re gonna have free will and boy is this gonna hurt. And that’s what we’ve been doing all these years. But no matter how messed up your life is you can be a child of God. Right now. That’s what John says and that’s the truth. And have a future. But the reason we keep participating in self-destructive dysfunctional behavior is because we need this God. We need God in our lives and we are unfulfilled so we fail. We fail over and over and over again. Now remember what we just read too. This amazing future that someday we will see God face to face. Do you realize what that means? This is your destiny. The only way you can fill that longing inside of you, that need, is to begin to have a relationship with your Father through Jesus Christ. And this has to become a daily activity. A daily activity. Now once again I want to remind everybody that’s watching, everybody here did receive a free study aid to continue to expand upon this and you can get your free copy by going and just calling the number, calling the number on the screen or going to beyondtoday.tv and when you do you can download it or order your own free copy. You were born to be a child of God! The Creator God wants this relationship and He wants it to become the driving force in your life. You say yeah but I got problems. You know a loved one dies. A hurricane destroys your home. How does God’s purpose help you in that? Well we read in 1 John that it is possible to have a relationship with God as your Father right now. This means God is personal. He’s not out there not wanting to connect to you. He wants to connect to you so it’s about becoming what you’re supposed to be now and to looking forward to the future. Now it’s interesting if we went back to that scripture in 1 John he says that we must purify ourselves. If we have this hope that we are the children of God, if we have this hope and this future we’re supposed to purify ourselves. How do you purify yourself? Well you and I can’t purify ourselves of ourselves. What this means is that at the core of your being you must acknowledge that you are the corrupted image of God. You were made for a purpose and you’re not fulfilling that purpose. You must recognize that you are not living as a child of God and you must ask Him, ask Him to draw you towards Him. And that means worshipping Him, obeying Him, and understanding who Jesus Christ is. Now let me say something here. This message is just as true for Christians as non-Christians. It’s easy for Christians to say yeah, yeah brother Petty, hit’em. Well you know what, if we celebrate the name of Jesus and we say He’s our Savior and there is no corresponding change of heart and mind so that we become a child of God then our religion is rather meaningless. You see a true Christian doesn’t just profess Jesus. He or she must become is a disciple, a follower, an imitator of Jesus Christ. We must know what Jesus taught and dedicate our lives to those teachings. And by becoming a disciple of Jesus you will embrace what it is to be a child of God because that’s what He taught. At the beginning of the program I talked about working in that shopping mall, empty shopping mall, to help those people that had been just devastated through Hurricane Katrina. A couple weeks later I had a totally different experience. And it was in a shopping mall and it was with the same people because the congregation where I pastored we were working in a shopping mall this time because it was the grand opening of this beautiful new department store. Upscale department store and they had some churches come in and make some money. You know by working and helping them out, stocking and so forth. And when we were in the midst of all this I had this experience and I remember it just like it was yesterday. I’m standing in the shopping mall and it smells so good. And everybody’s dressed up so nice. And over here there is this little ensemble and they’re playing classical music and there’s all these hors d’oeuvres, there’s no pizza to be found, all these hors d’oeuvres and there are people buying very expensive perfumes. People in very nice clothing buying very expensive watches, jewels and I’m standing there watching all that and I’m standing there thinking about the other place I was a couple weeks earlier. And then it dawned on me. That moment when you say ahhh life changes. The woman who lost her baby and the woman who was standing there buying you know a perfume that wow I can never afford that. The man who asked me why was I stranded on my roof for hours and hours and hours and nobody came to save us. Why? I didn’t have an answer for that. And the man who was standing there buying a watch and I’m thinking man I bought cars for that much. A little exaggeration, but not much. They are basically the same people. People living every day whether with tragedy or all this excitement of spending money and doing all these things. They’re people who don’t understand their purpose. They’re people who are still searching for their Creator God. Just trying to fill that void. 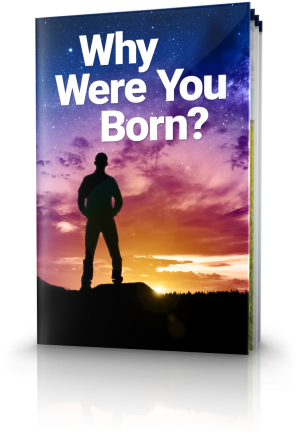 Remember if you can to get your free copy of “Why Were You Born.” This is very important for you, call the number on your screen or you can go to beyondtoday.tv where you can download it or even order a copy right there. Authentic Christianity is not a tepid, half-hearted, part-time, religious feeling. Authentic Christianity is about being restored to your purpose and why God made you in the first place. It is about transformation. It’s not about just going to church. It is about giving everything you have – everything, your whole life — in order to receive from God everything He wants for you. You and I were born to embrace a new life. That’s what Christianity is. To be reconciled to God through Jesus Christ and to accept a gift that we cannot earn because why? How do you restore yourself? How do you make yourself what you’re supposed to be when you’re already in the image of God that’s been so marred and beat up it’s not even recognizable and in fact you don’t even start to get better until you recognize it. You and I were born to receive incredible spiritual power from God that is described in the Bible as “love, power and a sound mind.” That’s what God wants to give you. You and I were born to be victorious. To have the power to overcome, and endure all the problems in life. Now this remarkable truth has been shown to you. God wants you to embrace that reality that you were born to fulfill His original purpose to and to be a child now and forever in the Kingdom of God.